UNITED NATIONS, September 13 -- When in the UN on Monday night a war film was screened, with a free spread of cheese cubes and white wine outside, most took at face value the announcement that it was sponsored by Kazakhstan's Mission to the UN. The film was “A World Free of Nuclear Weapons.” The speakers included Norman Atkins, an expert on Sudan from the UN Department of Peacekeeping Operations. How could a real estate entrepreneur be allowed to sponsor an event in the UN? Inner City Press asked the Under Secretary General of the Department of Management Angela Kane. She said that when a member state asks to use UN space, no check is made. After the fact, she said, a review can be made. Back in the reception space in front of the Dag Hammarskjold Library auditorium, all copies of the event program were confiscated. It was argued that “Eddie” Trump of the Trump Group is not affiliated with the better known Donald Trump. But what is the connection? “Stop asking questions,” Inner City Press was told. For now, there is no choice. Watch this site. 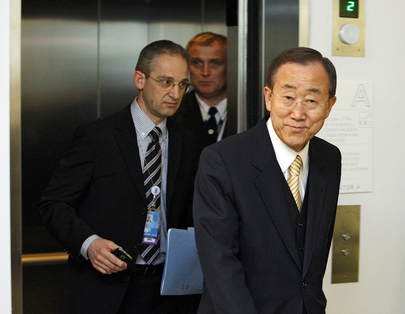 UNITED NATIONS, September 13 -- Ban Ki-moon and his team, trying to manipulate the media, will attempt to use the upcoming UN General Debate to nail down a second term for “Mister Ban,” UN sources observing Ban's recent behavior say. On Monday, Ban and his spokesman Martin Nesirky chose and answered questions, none of them on such topics as the UN's inaction in Darfur, Myanmar, on the rapes in the Congo, or corruption and dissension in Ban's own administration. But these are issues over which the UN, and Ban in particular, have no power at all. What about Sudan, where despite two $1 billion peacekeeping missions, Darfurians are slaughtered without the UN coming to their aid before they get permission from Khartoum? How about Eastern Congo, where hundreds of women were raped within short distances of UN Peacekeepers? Ban's envoy to the Congo, Roger Meece, blatantly misspoke to the UN press corps, saying that the first his Mission heard of the rapes was August 12. Disproved by a July 30 e-mail sent out by the UN, there has been no retraction, much less accountability. But what about the critique of Inga Britt Ahlenius? No questions on that, none of the promised follow up briefing. At Ban's last press conference, he said that the Ahlenius critiques, of corruption and weak leadership, were “too small,” and would be the subject of a separate briefing - which has yet to occur. An issue which seems to have entirely fallen off the table, with the Ban administration's push, is the panel of experts on the war crimes in Sri Lanka. Ban announced his panel in March, but its work -- and four month time clock -- has yet to begin. No questions on that, no answers: issue disappeared. Ban's trip to Rwanda is now viewed as an attempt to keep the issue of genocide in the Congo under wraps until after the General Debate, at which Ban will attempt to be omni-present in a highly controlled way, with critique questions screened out by Nesirky. Likewise, the top post in UN Women will be used in this way, sources say: either Michelle Bachelet to ward off a challenge for Ban's second term, or less likely now Rwanda's foreign minister, in an attempt to forestall untimely hypocrisy criticism from Rwanda. So it goes in Ban Ki-moon's UN. Nesirky, who has loudly proclaimed that as to UN briefing there “are no rules, it is my briefing,” may now say that he was attempting to spread questions around. But given the UN's spending and responsibility in Sudan, once no questions on the topic were asked, it was Nesirky's job to allow such questions. He pointedly did not. Watch this site. 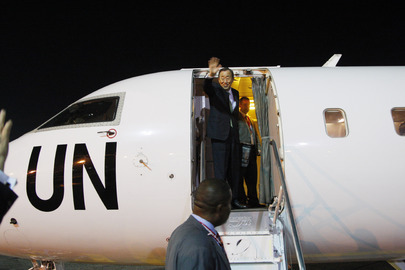 For UN, Is Merely Being There Enough, with Ban Under Fire for a 2d Term? UNITED NATIONS, July 26 -- What has Ban Ki-moon accomplished as UN Secretary General in Myanmar and Sudan, Inner City Press asked his spokesman Monday, for the fourth day in a week. “His record is clear,” Spokesman Martin Nesirky replied. “From standing in front of a still burning warehouse in Gaza, to visiting Haiti five days after the earthquake, to visiting Darfur refugee camps... he has achieved a huge amount.” Video here, from Minute 26:55. But the three achievements listed were only “being there” -- celebrities have traveled to Haiti, and to refugee camps in Darfur and elsewhere. Meanwhile reports on the UN's performance in Sudan are largely negative. Rubble still fills Haiti's streets. And even the Goldstone response is late, due to failure to translate. Myanmar, telling, was not even mentioned. Is being there enough? Only this year, Ban after saying he would name a panel of experts on war crimes in Sri Lanka, then delaying 90 days, has gone out of his way to limit the scope of the panel to providing advice on “models of accountability” to himself and the Rajapaksa government, if they want it. The Rajapaksas have said they will deny visas to the group; Ban through Nesirky has repeated declined to comment on the refusal to cooperate. Now a brewing fight is Ban's decision to bypass South African and other developing world candidates to nominate a Canadian, Carman Lapoint-Young, as the new head of the Office of Internal Oversight Services. Inner City Press, which reported exclusively on the move on the night of July 23, asked Nesirky for Ban's response to developing world countries who say the post was meant for their regions. Nesirky once again declined comment, except to say there is “very strong, overwhelming support” for the nominee. Sort of like the overwhelming support for a second term? 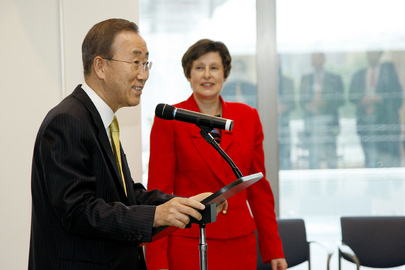 It is time for Ban Ki-moon to speak for himself on this controversy -- time for him to “be there,” as it were. He will appear before the press Monday at 5:30. Before his appearance Friday at a reception for the press, Inner City Press was repeatedly told not to ask about the controversy, not to “hijack” the event. That cannot similarly be asked on Monday evening. Watch this site.